With last week’s home game postponed due to the weather, it was back on the road again for Berwick. New signings Ouzy See, Declan O’Kane, Jack Hamilton and Alex Petkov all featured in the starting lineup. With Captain Stevie Notman and Michael MCKenna sitting this one out due to suspension. Cowdenbeath also strengthened their squad during January, With four new signings, Aiden Malone, Ben Reilly, and David Cox all in the starting line up and Jordan Hornby starting on the bench. Cowdenbeath started this game at the foot of the table having picked up only nine points in 19 games, Berwick sitting in seventh having picked up 21 points in 19 games. It’s a game both teams wanted to win, Cowdenbeath desperately needing the points to lift themselves from the foot of the table and Berwick wanting to increase the gap from the bottom of the table. Berwick continued on the attack and a further shot from Stephen Thomson on the 9th minute was saved again by the Cowdenbeath keeper. David Syme for Cowdenbeath came close in the 17th minute with a header from the left hand side of the box. Berwick continued to press down the left hand side. The result of this producing an excellent cross by Gary Phillips into the box for Jack Hamilton to head home a very well worked goal on his debut for the club. Berwick continued to push the attack and most of the game was played in midfield until another break for Berwick in the 37th minute saw another shot from Ouzy See saved by the Cowdenbeath keeper. The wind and the rain was still hampering play and Cowdenbeath had two further corners that resulted in nothing. Then in injury time of the first half Alex Petkov gave away a foul in the penalty area. Harvey Swann slotting home the penalty to bring Cowdenbeath level. The second half started and it was the turn of Cowdenbeath to play into the wind and the rain. Berwick won corners in the 48th minute and the 52nd minute as they pressed Cowdenbeath but both corners yielded no results. In the 40th minute, Steven Thompson picked up a yellow card for a foul. 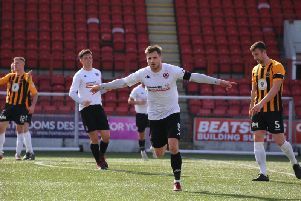 Then on the 54th minute Stephen Thomson let rip with a left-footed shot from more than 30 yards away that flew in off the underside of the bar leaving the keeper with no chance to save it. Surely a contender for goal of the season. Both teams continued to trade blows in midfield and both being hampered by the strong wind and the driving rain. In the 61st minute, Cowdenbeath player Fraser Mullen was booked for a foul. Steven Thomson taking a shot from the free-kick but put it over the bar. Then, in the 76th minute, Jamie Pyper picked up a yellow card for Cowdenbeath –Kieran Stewart for Berwick Rangers also picked up a yellow card shortly afterwards in the 79th minute. In the 82nd minutem Stephen Thomson’s Cross found See in the box, who headed home from close range to make it 3-1 to Berwick. In injury-time Berwick player Declan O’Kane had a shot from a direct free-kick more than 35 yards out but it went high over the bar.